www.photomacrography.net :: View topic - The new 50MP cameras Ok for macro? The new 50MP cameras Ok for macro? I agree, bring on the pixels. See HERE for an experimental demonstration that an f/11 lens resolves enough detail to require almost 50 megapixels on an APS-C sensor. Or HERE to show stressing the resolution of a 36 megapixel D800E with a reversed Componon-S enlarger lens purchased for $110, shipping included. Apparently the references given above are not working to make the point, so tonight I shot another demo. This is again using the methodology described at http://www.photomacrography.net/forum/viewtopic.php?p=101164#101164, where a lens's image gets captured in two ways: once by direct projection onto a camera sensor, and then through a 10X objective so as to mimic the effect of having a lot more pixels on the sensor. The camera in this case is a Nikon D800E, full-frame at 36 megapixels, with no anti-aliasing filter. I think you won't have any trouble guessing which is direct projection and which one mimics having a lot more pixels. OK, now that you're suitably impressed with how much it would help to have some more pixels to use with this obviously top-notch lens, let me fill in a couple of additional details. The lens is an EL Nikkor 50 mm f/2.8, set at f/5.6, and running just a hair over 1:1 (effective f/11). We're talking here about a lens that can be purchased routinely for around $50 on eBay, and which has a well deserved reputation for being not very sharp around 1:1. Nonetheless, it handily outresolves 36 megapixels, capturing around 4 additional elements in this USAF resolution chart. 4 elements is a ratio of about 1.59:1, and that's on each axis. So, 36*1.59*1.59 = 90 is the corresponding number of megapixels that might stand a chance of capturing all the detail from this not particularly good lens. Additional technical details: Images processed from NEF using the raw converter in Photoshop CC 20141204.r.310 x64 with default settings for smoothing and sharpening. Single frames selected at best focus from a series that was focus-stepped at 0.003" = 0.075 mm. Continuous illumination, shutter lockup plus 25 seconds exposure to kill shutter vibration, ISO 200. The false color is a form of Moiré associated with fine light/dark patterns projected onto a Bayer sensor. Here is the above exercise repeated using my 50 mm f/2.8 Schneider-Kreuznach Componon S. This lens tolerates a little wider aperture, so I ran it at f/4 (effective f/8). I'll let somebody else do the calculation of how many pixels would be needed. It's a lot. Rik, what a lovely pair of demonstrations! The day will come when old-timers say, "When I was a kid, camera resolutions were measured in megapixels." I engage, of course, in hyperbole--it won't require entire human generations to effect such changes of magnitude. It will happen much more quickly. And optical physics may play a small role. Interestingly, the difference between the two lenses on the 36MP sensor direct, is only perhaps one set of bars for resolution. 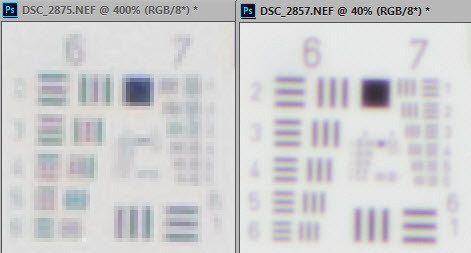 It doesn't take much downsizing of the image to lose that difference completely, but there is a more noticeable difference in the contrast of the large square. Desaturating, black to white measure ~ 86:224(N), and 58:224(SC). Given that this Schneider is "better" than this El Nikkor, I'm thinking that it may be this contrast difference which is more important than the absolute resolution. 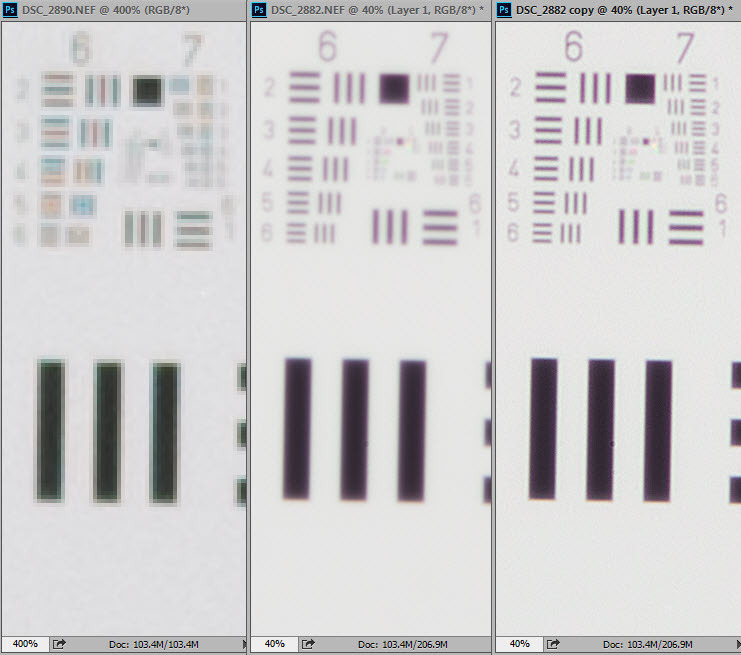 The Nikkor's contrast improves when looked at through the 10x objective, to about match the Schneider's. I'm not sure what's going on here, it appears the sensor itself is losing some of the lens' contrast in fine detail. So if the sharpened image of the Schneider-Kreuznach Componon S resolves group 7 element 4(looks like it to me), I calculate a ratio of 2.25. So a whopping 182 megapixels are needed! Caution: I made no attempt to carefully control for contrast and flare, either in the original shooting or in subsequent processing. In some of the images I definitely did make "exposure" adjustments in raw processing, so as to make the 10X and direct projection images more or less match in overall appearance. I don't recall whether I made "shadow" adjustments in the images shown here, but it's a distinct possibility. If I had intended to do a lens comparison test, I would have been a lot more careful about controlling for flare and processing. ...50MP Full frame sensors ... will the pixel size mean they are diffraction limited to the point of being useless? Yeah, that sounds about right. If you'd like to see an even bigger number, let me put on a good landscape lens and run it at a real f/4, instead of effective f/8. That'll pick up roughly another factor of 2 on each axis, pushing us close to a full gigapixel. On the other hand, this whole issue reminds me of the joke that ends with the accountant asking "What would you like the answer to be?" As I've repeatedly shown, it's not difficult to demonstrate in lab setups that really big pixel counts would be needed to capture all the detail that's present in an optical image. But those demonstrations require very careful control of vibrations and focus. If the subject is 3D, or the lens has any curvature of field, or the lens mount is not perfectly parallel to the sensor, then you're forced to stack. Get everything perfect, and you still have to figure out how to display the image. 50 megapixels will make a 20"x30" print at just short of 300 dpi. Are you going to do that, and then is somebody going to look close enough to appreciate the 300 dpi? Or equivalently, are you going to load those 50 megapixels into a zooming viewer, so that people can dig down to see all that lovely detail? For some folks, the answers are surely "Yes!" But in the grand scheme of things, I'm guessing that most people won't care. Either way, it won't be diffraction that makes 50 MP pointless. Bring on the pixels! The SK 50mm Componon S you were mentioning; is that the Makro Iris (Unifoc system) I recently picked one up and it is superb between 1-2 and 1-1. I haven't given it a solid try out reversed but I suspect it will do well. Visually it looks like the many that turn up on eBay when I search for "50mm componon-s". A current example is HERE, except that box shows a different Code 14849. I have no idea what the Code really means. EDIT: a typo - I corrected "3200 gigapixels" to "3.2 gigapixels"
Mine is the modern V mount version. From the little I know its almost , if not exactly, the same as yours it just has more modern coatings and a few other useful, but not necessary, features. The V mount is simple a V shaped channel. the lens has a V mount at each end so that it can be simply reversed. the aperture ring is clickless and its designed to be locked in place by three grub screws. I found on my A 7r it performs best at F8 while on my A65 its best wide open. As a sony user and specifically an A7r owner I have been watching the rumours regarding the next update of the A7r, Last year people were saying Sony would be producing a 50mp plus camera..... more lately the rumour has been the A7rII ( supposedly to be announced in 2-3 weeks) would be the standard 36 MP with 5 a six IBIS and an EFCS ( like the already available A7II). 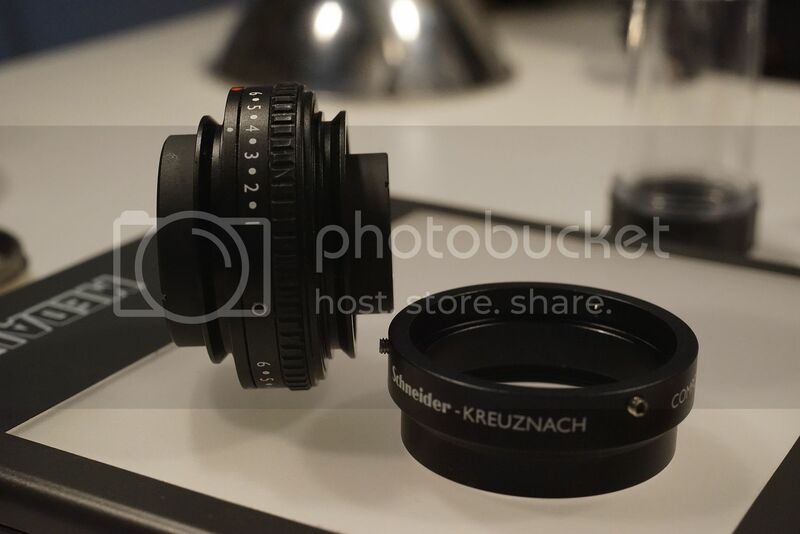 Zeiss has been working closely with Sony and it is quite possible they might have a prototype A7rII to play with. Zeiss in advertising their new Batis lenses for the sony e mount system posted a picture( reported as being taken by a Sony A7r) that Sony Buffs are intrigued with. The pixel count indicates a 56 mp sensor!! There are two options Sony has been known to be working of a sensor shift app, like the oly app, allowing large MP pictures to be produced by a smaller pixel sensor. Alternately Sony is indeed producing a 56mp ff sensor.